Last October we had a weekend where we had two family weddings to attend in addition to our church's children's program. It was crazy, but it was great. My parents flew out for the occasion and my family was in charge of catering one of the wedding luncheons. However, this post is about the other wedding luncheon since that is where I encountered something new to me. The combination of raspberries and chipotle peppers! The (other) luncheon was catered by a local Mexican restaurant and was a do-it-yourself taco bar. Genius! One of the options was raspberry chipotle chicken. At first I thought, "Huh?" but I tried it anyway and, oh my, was I hooked! What a great combination of sweet and tangy and spicy! And to top it off, they offered a delicious cilantro avocado dressing to drizzle over your tacos. I loved how it cooled down your mouth from the spice of the chipotle peppers (although, let's be honest - it wasn't that spicy). I filed it away as something to try at home. Well, here we are a year later and I finally got around to it. 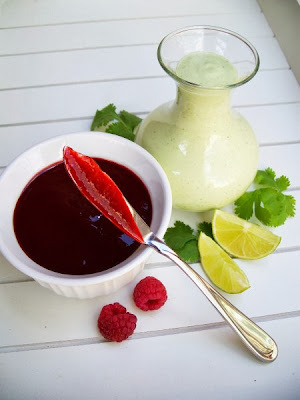 I investigated recipes for raspberry chipotle sauce and cilantro avocado dressing and never found exactly what I was looking for, but I came close enough. I ended up adapting each recipe to fit what I wanted. They pack some heat, but in this sauce I would say the heat is between mild and medium. Even my 9-year-old daughter loved it and she's not a fan of spicy. And if you strain the sauce like I do, you lose not only the raspberry seeds but any remaining bits of pepper that might ignite your tastebuds. If you're wondering what to do with the remaining peppers and sauce, someone recommended throwing the leftover peppers into a food processor, separating them into tablespoonfuls on a plate, and then freezing them. Once they are frozen, throw them all into a ziploc bag in the freezer. Then you have perfect portions for flavoring soups or what not. 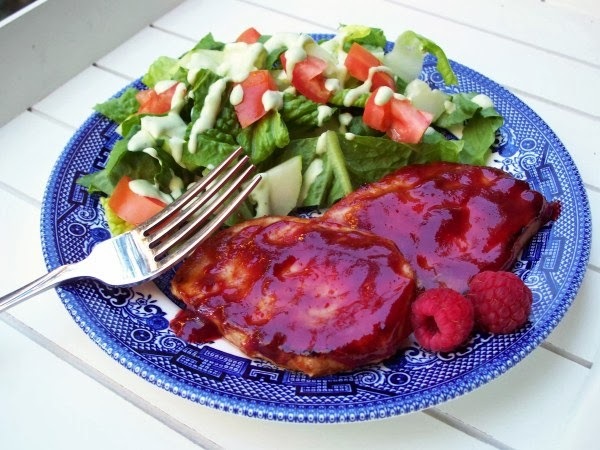 I've used the raspberry chipotle sauce two ways so far: mixed with shredded chicken for tacos (like my first encounter) and used as a glaze over pork chops. 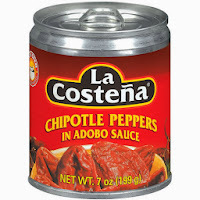 For the chicken, I prepared it with my usual taco seasoning first and then added a few dollops of sauce. Prepare yourself - the chicken will turn a purple-y color from the raspberries. 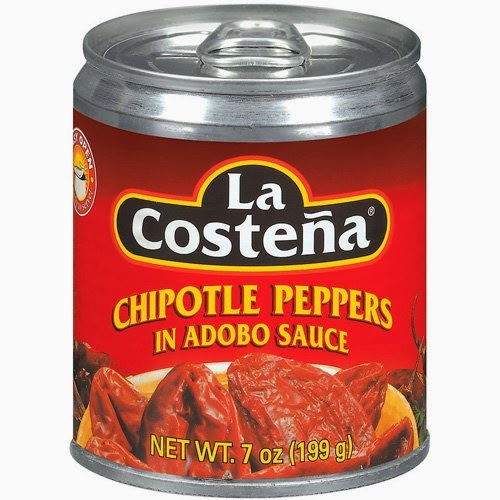 If this bothers you, you could always just spoon a little sauce into your taco instead. I also drizzled the cilantro avocado dressing in the tacos and it was delicious! I've also read that people like to pour it over a block of softened cream cheese and serve it with crackers for an appetizer. 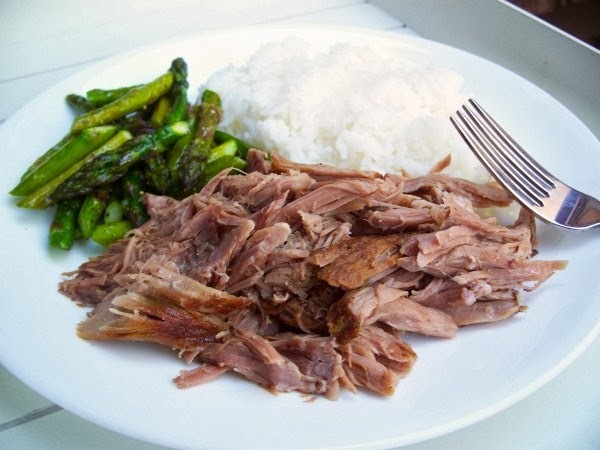 There are so many possibilities with this sauce since it pairs well with chicken, beef, pork, and probably fish as well. Whatever you do, just try it! I'm pretty sure you'll love it too. In a small saucepan, combine all ingredients over medium heat, mashing the raspberries. Bring to a gentle boil, then reduce heat and simmer until sauce is thickened and reduced by half (about 15 minutes), stirring occasionally. Strain sauce through a fine mesh sieve, if desired. Makes a little over 1 cup of strained sauce. Can be refrigerated up to two weeks. Combine all ingredients in a blender and process until smooth. Chill until ready to serve. Makes a little over 2 cups. Can be refrigerated up to 5 days.